Click the button below to add the Fletcher-Terry Gemini Pro Large Format Cutter to your wish list. Finish the job faster with the efficient Gemini Pro Cutting Ruler from Fletcher. This two-in-one-tool is a precision bench-top ruler designed for cutting and trimming flexible and semi-rigid materials. 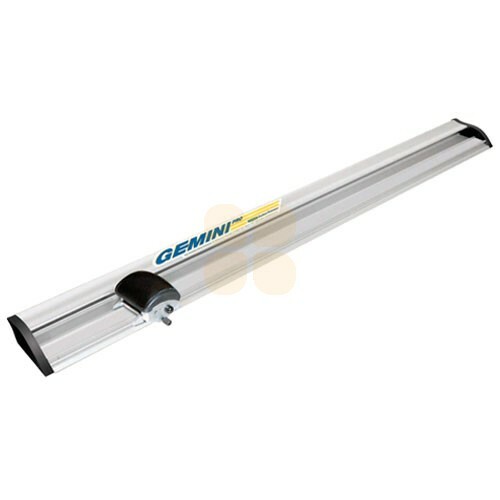 The Gemini Pro is a state-of-the-art device shaped with laser technology to within 0.2 mm over the 3 m length of the cutting ruler (1:15000). This advanced accuracy makes the Gemini Pro an excellent choice for use on banner material, vinyl, PVC foam-board, honeycomb and corrugated plastics, paper and many more display materials.